NICOLOSI - Titlepage: Studium Geographicum. NICOLOSI, J,B. - Titlepage: Studium Geographicum. Titlepage: Studium Geographicum. - NICOLOSI, J,B. Title : Titlepage: Studium Geographicum..
Map maker : NICOLOSI, J,B.. Size : 10.6 x 7.2 inches. / 27.0 x 18.3 cm. 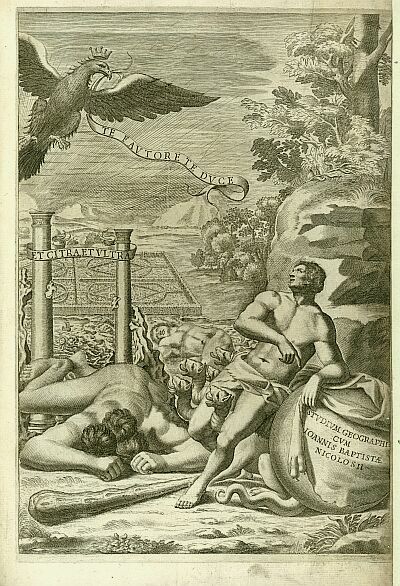 Description :Uncommon title page by the Rome publisher Joannis Baptistae Nicolosi (active 1610-1670). Condition : Right hand margin cut till neatline and re-inforced. Dark impression.